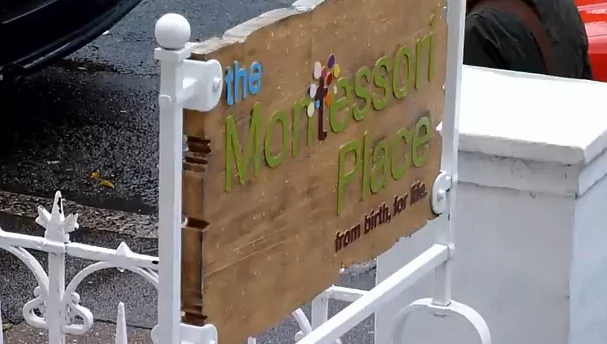 I’ve just read this week’s edition of The Montessori Times, together with it’s new magazine supplement ‘Thinking Positive’ both of which are entirely child-initiated and produced. Together they embody much of the energy in the Elementary this past week or so. The involvement has spread to around half of the Elementary now either as writers, interviewees or regional reporters (via the phone to Hove). If you haven’t seen copies of these, do make enquiries an I’m sure you will be able to lay your hand on a copy. So what else? It’s always so hard to capture the diverse energies of a week in the Elementary since, amongst the big themes that involve groups of children, there are always so many the individual bits of work, or work in twos or threes that are woven in amongst the very visible themes. It’s a bit cooking; there are main ingredients supported by a multitude of side dishes, herbs and spices. It is that diversity and variety that gives the Elementary Community its exciting vibe. Interesting things happening in all corners of the room, and outside. As reported in TMT, two children were counting out how many grains of rice make up 10g in order to calculate – in the spirit of the old Asian fable – how many grains of rice would fill a chess board if you started with one, and doubled the amount on each subsequent square. They are around two thirds the way there and in the trillions. A powerful experience of the exponents of numbers. Here is a flavour of just some of the other ingredients; two children are working on a long term project creating biographies of ‘great women’. One child is creating a world map showing the percentage of each country’s population that works in agriculture. Four children beginning some explorations of bird migrations.Two children creating a timeline of UK history. Three children working together on a collection of poems in the style of William Blake. Three children creating a book of triangles having bisected their angles to find their incentres. Two children writing lists of nouns they find around the room. Two children making of clay tablets (mined from a clay pit in the woods) inscribed with Sumerian cuniform writing. Four children working with the decimal chequerboard to see what happens to the size of a number when you multiply it by a fraction less than 1. A bunch of children cross stitching. Two children creating pie charts showing survey results of the Elementary children’s favourite elements from the periodic table. Once child classifying our rock collection according to type (igneous, sedimentary, metamorphic). Three children conjugating verbs in the simple and continuous form (I run vs I am running). One child cutting down holly shoots from the Children’s House garden. The examples are practically endless. 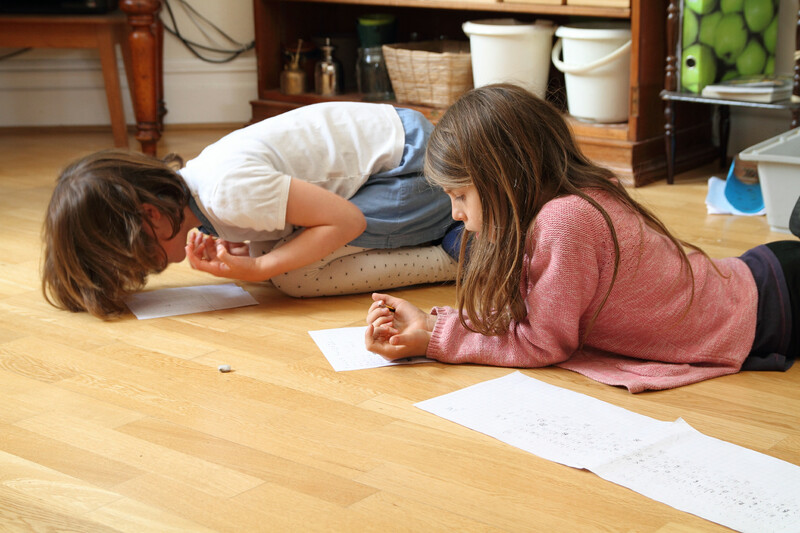 Squaring and cubing form a significant part of the Montessori maths curriculum, so much so that at any given moment you are quite likely to find someone working on this. For me the most memorable squaring moment of the week came at the end of Thursday. When I finish reading to them (The Secret Garden) just before 4pm, I dismiss them it little groups so that there isn’t a mad scrum in the cloakroom. Sometimes I do this with a, ‘If you are wearing…’ type approach, or, as on Thursday, by asking for a good multiplication fact. Mostly they’ll offer a a basic combination (6×7=42 etc), but this week I was offered, ‘4732 squared is 22,391,824 – I know because I did it today’. Such a lovely example of the joyful intellectual exploration of the Elementary age. Over the last few days squaring has been taking place at three different levels of complexity/abstraction from seven years olds transforming the square of 10 into the square of 2+8 or 3+7, through to nine and ten year olds squaring numbers like 34 or 68 using the peg board material to convert them into 30+4 or 60+8, through to the paper-only graphical calculations of 4732 squared. If that is all Greek to you, then please feel free to come by at the end of the day and ask your child to show you the materials and how they use them. On the other hand, if ancient Greece is your thing then, like most of the Elementary, you would be excited about the ‘Greek Day’ that is being planned by some of the older children. It is a real pleasure to say that I have not been involved in any of the planning for this; it is a greatly satisfying when they become capable and independent such that they don’t need my guidance/advice/input or suggestions. A typed schedule for the day has been put up and the children are signing up to various activities that will be run by other children including writing on wax tablets, presentations of aspects of Greek culture and, of course, food. In a mixed-age community with the youngest half the age of the oldest there is a natural diversity to the work, and natural invitation to collaboration and support. Older ones have helped younger ones make books of math facts, helped them with addition, shown how to use the Fundamental Needs chart to explore Viking culture or, more practically, remove mud from the tracky bottoms of a younger child. Two older children are also preparing to give some presentations to younger ones on winter tree identification. Other times they help each other with spell-checking, how to use duolingo or forgotten facts. This week has also seen a two birthdays. That means each of them writes two ‘birthday letters’ and two renditions of our traditional ‘Cut the Cake’ birthday song/rap. The birthday letters are one of the few pieces of required writing; everyone is expected to write a letter for each birthday that comes around. They provide a simple way in to structuring paragraphs, with the older ones coming up with three reasons why they like the person, with each reason backed up by three examples. The result, as most of you will have seen by now, is a lovely birthday gift as the letters are stitched together and a cover made. Finally, we’ve also had a couple of football sessions which have been really fun. Morgan has brought in some new yoga-ish stretches and a fun warm up game that involves trees, animals and chasing each other. We even managed to squeeze in some football. Some of the children have played mini matches, others have preferred a variety of games with footballs. This entry was posted in Blog, News & Letters. Bookmark the permalink. Both comments and trackbacks are currently closed.